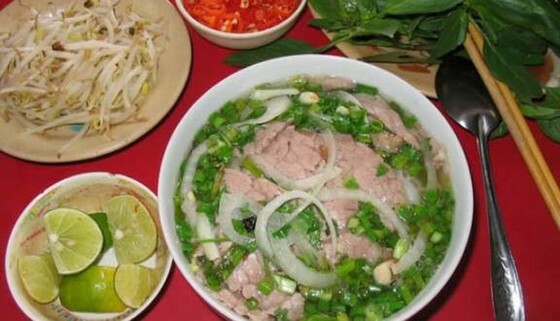 Pho is one of the very popular dishes of people in the S-shaped country – Vietnam. Not only that, it is also a favorite dish of many friends around the world and this dish is present in many countries. Pho Dalat is also one of the information that tourists are extremely interested in. Especially when having the opportunity to come to this poetic and lovely city. You can eat Pho for breakfast, lunch, dinner, or late at night…. Any time you can eat this dish. 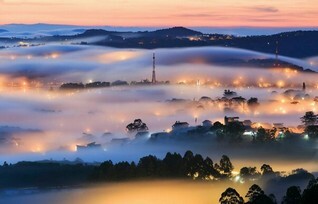 The following, Dalattrip.com will introduce to you details of Pho restaurants in Dalat. The restaurants are rated as delicious and popular with many people like and choose. So you will have the most accurate and appropriate choices during your stay here. The first shop: located at No. 2 Nguyen Van Cu Street, Ward 1, Dalat City. The second shop: 11/1 La Son Phu Tu Street, Ward 6, Dalat City. Service time: 6:00 Am – 22:00 daily. Located right at the location is very convenient for moving as well as travelling, so customers will easily come to the shop. 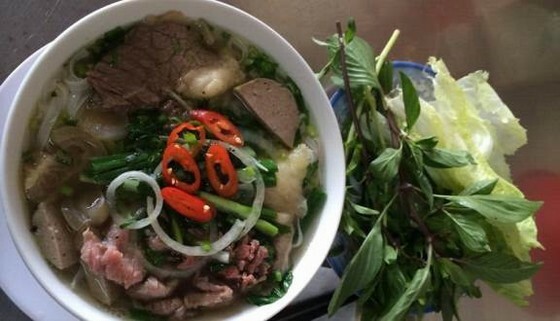 Enjoy one of the Pho flavors that are considered to be delicious and famous in Dalat. It is located in extremely good locations, close to the city center area. The shop space is small but the number of customers coming to the shop is not small at all. Rice noodles at the restaurant include sliced well-done flanks noodle soup, medium-rare beef and well-done flanks, sliced well-done flanks noodle soup, and sliced medium-rare beef… It is very easy and comfortable for you to choose. A bowl of Dalat rice noodles is quite big; the broth has a sweet taste, not sweetness from sugar or MSG. Although it is a beef rice noodle dish, the broth does not smell any beef at all. The smell is also not strong like other shops, the soft and delicious beef pieces that are extremely delicious. The vegetables served include lettuce, sawleaf, basil leaves, cinnamon leaf… The most special is that there is a big pot of vinegar onion on each table. You can put it in a bowl of Pho to eat as your favorite. In addition, there are dipping sauces served with the noodle soup. From the time of opening the door to closing the shop, it is always very crowded, but the service is quite fast and very attentive. There are 2 establishments for you to choose, the price of a bowl of Pho here is quite cheap. For children with prices of VND 18,000, small Pho bow is priced at VND 30,000, large bowl costs VND 35,000, and special bowl costs VND 45,000. Address: located at 23 Tang Bat Ho Street, Ward 1, Dalat City. It is located on a big street right in the downtown area. About 400m from Dalat market and Xuan Huong Lake, it is very convenient for customers. Around the shop, there are other shops and eateries for you to choose from. 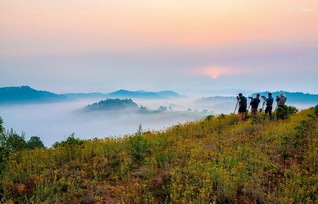 Especially, there are many cheap Dalat hotels with new opening for you to stay and rest. This is also one of the delicious Pho restaurants in Dalat. 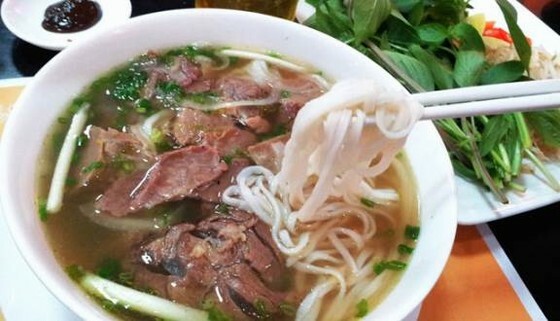 With a characteristic cold weather, it is great to enjoy a delicious hot bowl of Pho. 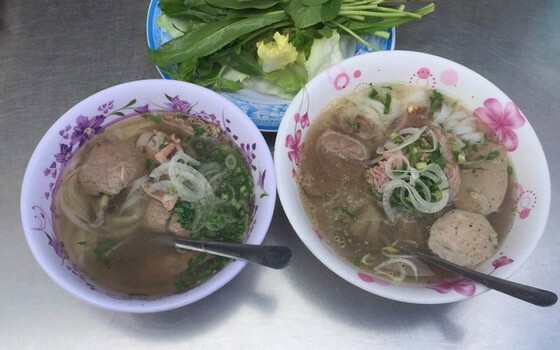 Similar to other noodle shops, there are many types of Pho for you to choose: sliced well-done flanks noodle soup, medium-rare beef and well-done flanks, sliced well-done flanks noodle soup, and sliced medium-rare beef, etc. Or you can order a bowl of mixed Pho that will be quite good. There are also cake served with Pho; it is attractive fragrant, crispy and aromatic. A small bowl costs VND 32,000, a large bowl costs VND 35,000, a special bowl costs VND 45,000. The number of diners coming to the restaurant is quite crowded. The shop is located right next to the hot soy milk shop in Dalat which is quite delicious and famous. The space is cool and clean, the service staffs are very caring and attentive. Address: located at 71 Bui ThiXuan Street, Ward 2, Dalat City. This is one of the few rice noodle shops in Dalat that retains the characteristic of the old Pho taste, a flavor of Hanoi. Soft rice noodles are not crushed, sweet fragrant broth without any monosodium glutamate at all, soft beef, good beef tendon… full spices for a bowl of Pho according to the traditional recipe. A bowl of Pho is hot with the sweet broth of tenderloin and bone. What’s more wonderful with fresh green vegetables are served with Pho. In addition, there is also a delicious dish of fried rice and pickle. If anyone has ever set foot in Hanoi, it certainly will not be strange to this dish anymore. Address: located at 5 Pham Hong Thai Street, Ward 10, Dalat City. This is a famous rice noodle shop which is very popular with many local customers. The taste of Pho here is quite good; the broth is clear but very tasty. 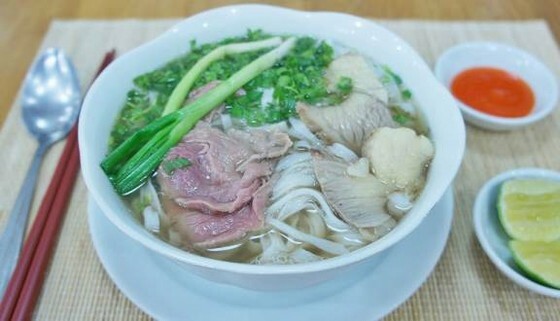 The beef are sliced ​​and soft; the most characteristic of the Pho bowl here is that there is a lot of green onion. It makes the bowl of Pho more attractive and good smell. In the past, the restaurant was located on Nguyen Van Troi Street but later, it was moved to Pham Hong Thai Street. Located 7 minutes away from the center, it is very convenient for customers. Address: located at 429/4 PhanDinhPhung Street, Ward 2, Dalat City. This is also one of the best rice noodle shops in Dalat which is famous and appreciated by customers. The taste of Pho here is fragrant. There are beef rice noodle soup and chicken rice noodle soup for you to choose. The beef pieces are quite big, sliced, and fragrant with broth smell. It is great to dip some cake in the soup. Small bowl costs 30,000 VND, large bowl costs 35,000 VND, special bowl is priced at 50,000 VND. Depending on your ability, you should order the best bowl of Pho. These are some rice noodle shops that are evaluated as quite delicious and famous in Dalat City, each shop has its own flavor and its own secret so you should go to those places to try and feel.